It has long been suspected that a form of geodesy was used for determining the locations of some of the most prominent prehistoric British Monuments. One of the major problems with accepting this fact is that geodesy involves an operational understanding of geometry, astronomy and both longitude and latitude, the latter having only relatively recently rediscovered (following the creation of an accurate ships-clock in 1540). So how are we to explain the separation of the largest and most significant megalithic sites in Britain by units of exact degrees (remembering that a degree of latitude is different from a degree of longitude). Is it simply a set of coincidences, or can it be that our prehistoric ancestors had the capacity to determine the longitude and latitude of their sacred monuments, placing them into a geodetic relationship with each other. All of the information on this page can be confirmed with ordinance survey maps or through digital mediums such as Google-Earth etc. Many of the most largest megalithic monuments in Britain were built with a geodetic relationship to each other. Most of the remaining significant megalithic sites in Britain such as Glastonbury, Stonehenge, Avebury, Silbury Hill, Arbor Low, The Ring of Brodgar, Callanish, Tara Hill and the Boyne Valley passage-mounds in Ireland, are all separated from each other by units of degrees (based on a 360° division of the globe). This relatively startling information is supported by other significant geodetic and geometric connections between the prehistoric British/European complexes. (See table below for confirmation). In addition to an apparent placement of prehistoric sites according to a division of the globe by 360°, Christopher Knight and Alan Butler have suggested that there may also be evidence of use of a 366° division of the globe in prehistoric times. How this accords with the 360° placement is yet to be understood but their evidence shows that both Thornborough and Stonehenge share similar dimensions which appear to be based on circumferences of units of exactly 366° megalithic yards. The same dimensions could also be found in the now completely destroyed Dorchester-on-Thames Henge which lies on the St. Michael's Ley. The Association between Astronomy and Geodesy: There is a close, almost symbiotic relationship between astronomy and the megaliths which extends beyond the orientation and alignment towards significant celestial events, as some appear to have been located on latitudes that deliberately accord with those events. Stonehenge for example, was placed at the exact latitude such that the azimuths of the moon and the sun were at right angles to each other during the extreme settings of their cycles. The same latitude is also directly under the extreme northerly setting of the moon in its 18.6 year cycle. In addition, the Orkneys complex was located such that the exact same phase of the moons cycle, it would appear to 'glide' along the horizon at the latitude of the Ring of Brodgar, Maes Howe and the Stones of Stenness. The three arguably most important southern English sites ( Glastonbury, Avebury and Stonehenge), form a huge right-angled triangle across the English landscape. All of the sites have secondary relationships with each other, and all are separated by units of degree. The solar geometry of prehistoric England. It can be seen that Stonehenge sits almost exactly 1/4 degree south of Avebury (2 seconds of a degree out), and the distance from Avebury to the 52nd latitude is a hundredth part of the earth's polar radius (3). In addition, and crucially, Stonehenge and the important and contemporary 'Sanctuary', which leads to Avebury via the West Kennet Avenue, are on the same longitude. The observation of earthly measurements, combined with the astronomical and geodetic significance of the latitude, all lend to the suggestion that the monuments of the Salisbury Complex represented the centre of a prehistoric meridian. It is of interest to note that the Great pyramid and Silbury hill also share a particularly intimate geodetic feature: The Great pyramid has an exterior angle of 51° 51', which is the latitude of Silbury hill and the result of (360/7). Silbury hill has an exterior angle of 30°, which in return is the same as the latitude of the Giza complex (360/12). 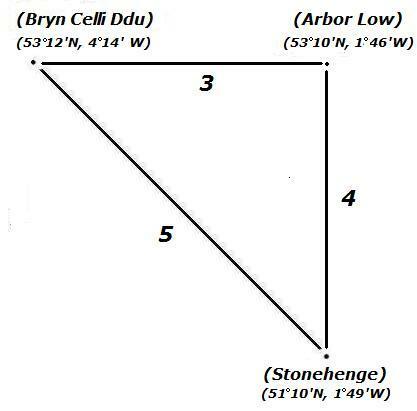 It is also a peculiar fact that Arbor Low (exactly 2° north of Stonehenge) sits on the latitude represented by the exterior angle of Khufu's pyramid (53° 10'), and the interior angle of the 3:4:5 Pythagorean triangle. Avebury is also located 1/100 of the planetary circumference from the two major archaeological complexes in Ireland, Newgrange and Tara Hill (3.6°) (4). Both Avebury and Newgrange have identically sized stone circles (103.6m), similar in size also to the Ring of Brodgar, and the top of Silbury Hill. Arbor Low is considered by many to be a centre of Ley activity in the British isles. 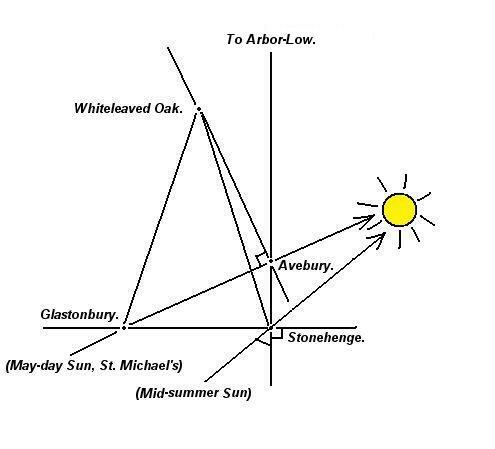 The significance of Arbor-Low is demonstrated through its alignment with Avebury, Stonehenge and Glastonbury. The fact that Stonehenge, Avebury and Glastonbury Tor form a perfect right-angled triangle is sufficient reason to suspect a larger prehistoric design between monuments, but more curious still is that when the line is extended north from Avebury, it connects perfectly with the Henge/Circle Arbor-Low in Derbyshire. 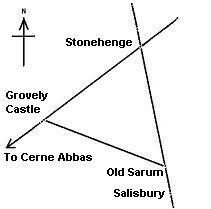 This means that Arbor-Low is the northern-most point of a larger right-angled triangle with Stonehenge and Glastonbury. Perhaps no coincidence then that it sits exactly 1° east of Glastonbury and 2° north. Arbor Low sits 1° East of Glastonbury Tor and 2° North. Arbor Low also sits 5° South of Callanish and 5° East. The apparently deliberate placement of significant prehistoric sites by exact degrees of both longitude and latitude is something that is also commonly seen in other ancient cultures such as the Ancient Greek oracles, several middle-eastern sacred sites, and in early dynastic Egypt, all of which show high levels of Geodesy in the placement of the most significant sites. The Arbor Low Henge-circle can also be seen to connect with another two henge-circles; Stonehenge and Brynn Celli Ddu, forming a Pythagorean 3:4:5 triangle on the landscape. The Geodetic Relationship between European Complexes. Orkneys 58° 59' 56" N, 3° 11' 20" E.
Thornborough 54° 12' 13.9" N 1° 33' 24.84" W Latitude 1/10th planet circumference from Pole (366° division) 4° S of Callanish. The first professional suggestion of geometry at British Megaliths was by Sir Norman Lockyer, the Astronomer Royale, who observed that Stonehenge, Grovely Castle and Old Sarum are equidistant, forming an equilateral triangle across the landscape. this geometry is reinforced by the fact that the Stonehenge-Old Sarum line continues another 6 miles to the site of the present Salisbury Cathedral, then onto the Clearbury rings and Frankenbury. John Michell has became one of Britain's best known recent Geomancers. His pioneering work on the alignments and geometry between prehistoric sites won him acclaim at an early age. He is remembered for a number of significant geomantic discoveries. One of Michell's best known discoveries is the 'St. Michael's' Leyline, which crosses southern England from Cornwall westwards all the way to Norfolk, passing several prominent megalithic sites along the way. The alignment has a clear association with astronomy, running along the azimuth of the may-day sun (also known as St. Michael's day). The provenance of many of the sites (i.e. The Hurlers, Glastonbury, Avebury, Walauds Bank etc) make it likely that the alignment originated at some time in the late Neolithic (c. 3,000 - 2,500 BC). Although the exact nature of this alignment is still unknown, there seems little doubt that the St. Michael's ley is a 'linear' relic from a time when we were communicating our thoughts about the universe through the alignment and orientation of ancient monuments. The St. Michael's theme is seen in ancient France as well, especially the site known as Mont St. Michel, which connect to Glastonbury both geodetically and geometrically. An alignment is also said to run across Europe connecting all the sacred St. Michael sanctuaries in one huge alignment that stats/ends in Israel. The St. Michael's connection is only just beginning to be understood. 'It is triangular, with one side facing Gaul. One corner of this side, on the coast of Kent is the landing place for nearly all the ships from Gaul, and points east; the lower corner points south. The length of this side is about 475 miles. Another side faces west towards Spain. In this direction is Ireland, which is supposed to be half the size of Britain, and lies at the same distance from it as Gaul. This side of Britain, according to the natives' estimate, is 665 miles long. The third side faces north, no land lies opposite it but its eastern corner points roughly in the direction of Germany. Its length is estimated at 760 miles. Thus the whole island is 1,900 miles in circumference' (3). 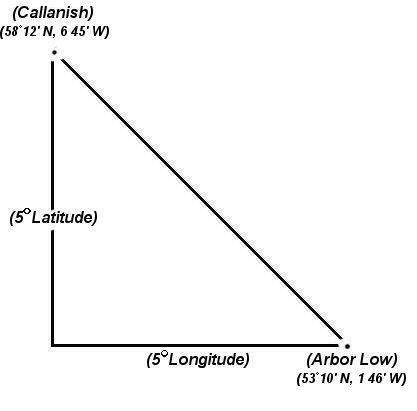 Although it is true that in this description, the three sides when divided by 95, produce a simple Pythagorean triangle with sides of 5, 7 and 9 respectively, the description clearly places one corner on the coast of Kent which suggests that the association between Britain and Pythagorean geometry is symbolic rather than actual as the location is impossible with these dimensions. We can see in the illustration provided by Michell that he places the bottom right-hand corner somewhere in Gaul (France) itself, completely ignoring the specific information provided by Caesar himself. John Michell first brought to the public attention the existence of a large scale geometric figure which he dubbed 'The Decagon' across southern Britain. The ancient Celtic ‘perpetual choirs’ at Llantwit manor, Glastonbury Abbey and Stonehenge were said to be 'three vertices of a regular decagon of majestic proportions. A fourth vertex exists at Goring-on Thames where a major pagan temple once stood at the junction of several important track ways'. The centre of the decagon is at the apparently insignificant hamlet of Whiteleaved Oak where the former counties of Hereford, Gloucester and Worcester came together. This decagon is related by angle and distance to the other geomantic centres of Britain. Note: Michael Behrend supported Michell's original concept but made two small changes to the original scheme. At present, no more than three vortices can be shown have a substantial enough accuracy and significance, although their distance and angle from each other certainly appears to be accurate enough to suggest the possibility of a deliberate, rather than incidental placement in these cases. The distance between Whiteleaved oak and both Stonehenge and Glastonbury is startling, accurate to within 1/1000th part, both sites are placed 100.5km from the centre, forming an almost perfect Isosceles triangle. The inclusion of Goring on Thames to the north-east , which sits on he junction of the Ridgeway and the Icknield way, also shows an extremely significant accuracy with an error of no more than 5 parts in 1000. Whiteleaved Oak is situated at 52° 01' 20" N , almost exactly on the 52nd parallel. (Click here for 1891 O/S map of Whiteleaved Oak). 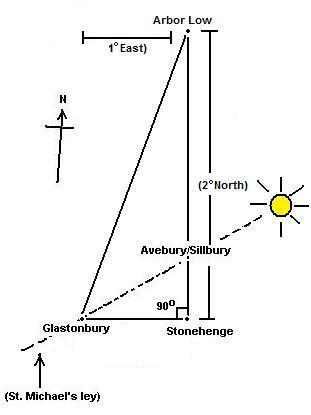 The discovery of a geometric relationship between Glastonbury and Stonehenge is not unique. The two sites are also associated with several other ancient structures in Britain (such as the right-angled triangle formed with the inclusion of Avebury/Silbury (Arbor Low). The strong astronomic and sacred nature of these sites is reminiscent of Lockyer's earlier theories concerning the alignment of such sites, and it is tempting to conclude that such factors resulted in a geometric relationship. However, such a synthesis by no means precludes the idea that geometry itself was the original factor that determined the location of the sites. 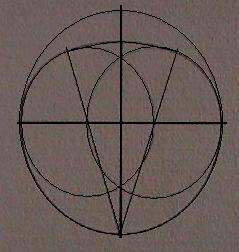 It is therefore interesting to note that the 'Decagon' is centred on the border of three counties (as is the Eastern end of the St. Michael's Ley (Norfolk/Suffolk border), but which, apart from the 'sacred' name and location on the 52nd latitude), has no association with either astronomy or religion. The most southerly edge of the proposed decagon is between Glastonbury and Stonehenge. This line almost sits on an almost accurate east-west axis (Approx 3° west of true north). In relation to this, it can be seen that a line from Glastonbury to the Avebury/Silbury complex (being a part of the St. Michal's Ley, which follows the path of the sun on may-day), simultaneously completes a perfect right-angled triangle with Stonehenge. 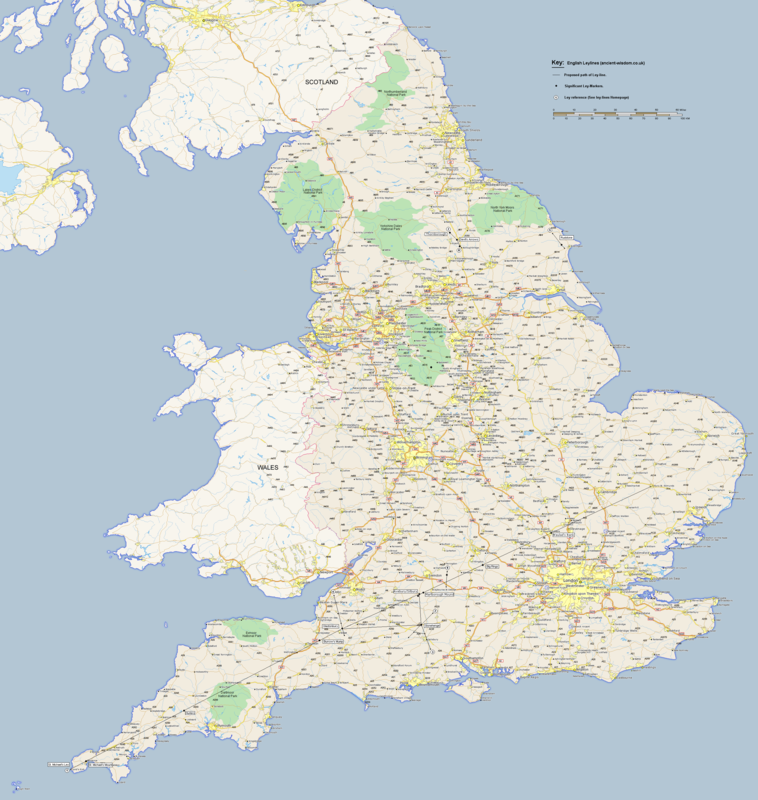 This simple observation illustrates the underlying geometric connection not only between the three main prehistoric sites of Southern England, but to several other prominent prehistoric sites. 4). C. Knight; A. Butler. Before The Pyramids. 2009. Watkins Publishing.